The only thing better than having lunch at Jason’s Deli is having lunch there for less money! And when you purchase a discounted Jason’s Deli gift card, that’s exactly what you’ll have! A deli-lovers dream, this restaurant has soups, sandwiches, pasta, and more! And with your discounted card, you will be able to enjoy the same great food, while paying less! Are you looking for the perfect casual eatery to cater your next big event? If so, then look no further! Why not leave it to Jason’s? Buy your discounted Jason’s Deli gift card today and use it for dine-in, carry-out, or catering! You can even use your card more than one time, as long as a balance remains. Just think, this means more great crowd-pleasing deli food, for less money out of your wallet! And don’t forget- gift cards make excellent presents too! Whether you are looking for the perfect place for the family to gather over a good meal, or for delicious catering, this is the deal for you! 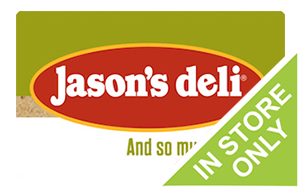 Buy your discounted Jason’s Deli gift card today and save money on one of America’s favorite fresh salad bars! but make sure you save room for dessert! At Jason’s, a trip to the ice cream bar comes with every meal! That’s right! They offer soft serve chocolate, vanilla and swirl ice cream, as well as toppings. So why wait any longer? Get your discounted card today and use it in any of their 268 North American locations to save money on the deli food you love! What could be better than a discounted Jason’s Deli gift card for saving you money? At Cards2Cash, we understand how hard it can be to save money, and because of this, we offer as many types of discounted cards as we possibly can! If you love to eat out but can afford to do it as often as you would like, then be sure to check out our listings for Schlotzsky’s, Fuddruckers, McAlister’s Deli, Moe’s Southwestern Grill, and more! Finally, Cards2Cash can help you to save more money than you ever have before while still eating the foods you love! If so, then you will be glad to know that Cards2Cash buys many gift cards! Not only do we buy them, but we pay high percentage prices for them too! If you have a gift card you would like to sell, just stop in one of our retail locations for payment made on the spot, OR simply fill out our online form and we’ll get back to you with an offer! What’s more, we buy cards for everything from restaurants to retail shops, so if you have it, we’ll probably buy it! With Cards2Cash on your side, staying on a budget is easy!